The first step in Chitty’s quilting journey was purchasing the book “Quilt in a Day,” by Eleanor Burns. She was determined give her daughter, Danielle, a quilt as a wedding gift, just as Grandma Carol would have. Chitty also knows that they would not be able to run as smoothly and efficiently without the help of full-time employee, Julie Yeager. She sends monthly newsletters, organizes classes and more. 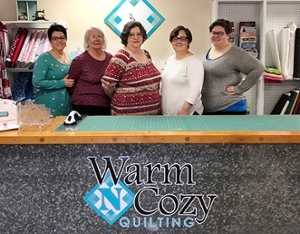 The Illinois SBDC for the Metro East assists start-up ventures like Warm N Cozy Quilting as well as existing businesses headquartered in the nine-county region of Calhoun, Jersey, Madison, Bond, Clinton, St. Clair, Washington, Monroe and Randolph. It is funded in part through a cooperative agreement with the U.S. Small Business Administration, Illinois Department of Commerce and Economic Opportunity, and SIUE as a service to Illinois small businesses. Photo (L-R): Warm N Cozy Quilting’s Julie Yeager, Trish Cyvas, Debbie Chitty, Danielle Cyvas, Sarah Neuman.